A British contribution to the Western genre as Rank attempt to transplant the expansive plains, exhilaration and barroom-brawls of the American western to South African grassland created within the confines of Denham Studios. The result is a hybrid and mediocre oddity that is only worth viewing for curiosity value. 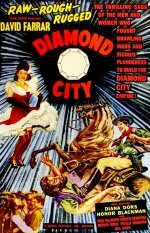 Set during the diamond rush of the 1870s in South Africa, two prospectors become bitter rivals. In the diamond fields of Klipdrift, sincere agent Stafford Parker (David Farrar) tries to bring law and order to the mining community, whilst crooked schemer Muller (Niall MacGinnis) cares nothing for fairness and makes money on the side by selling liquor to the natives. Parker believes Muller is responsible for illicit diamond trading and the two are on course for conflict.